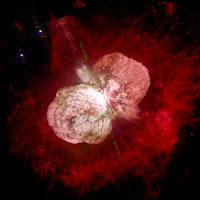 It’s name is Eta Carinae. It’s a star—or to be absolutely accurate—a binary star. And it’s getting ready to destroy anything within 50,000 light years of it…like Earth. Although few have ever heard of Eta Carinae, if things go wrong—horribly wrong—it could be the final, gasping words spilling from the gnarled lips of the last dying humans on Earth. Once and for all, Doomsday really will have arrived. Although it might sound like some Grade-B Hollywood End-of-the-World thriller, the scenario is very real. All too real. And it’s too close for comfort in more ways than one.If ever there was a ticking time bomb in our galaxy, it would be Eta Carinae—at least as far as life on Earth is concerned. For Eta Carinae is a killer waiting to strike. But the truly horrifying reality is it may have struck already, and we don’t even know it yet. When pushed on the issue, all astronomers agree that Eta Carinae could easily destroy all life on Earth, or at the very least, the side facing the death star when its celestial greetings of doom come knocking on our door. When will that be? It’s anyone’s guess. Some scientists think it could be within our lifetimes, even as early as—dare it be said?—2012.A hypernova will create a lethality zone radiating outwards as far as 50,000 light years. Unfortunately, the Earth is well within that death zone as the killer star lies only 7,500 light years away from us. Scientists believe such massive bursts are the cause of some mass extinction events during the Earth’s past. A team led by astrophysicist Brian Thomas at Washburn University theorizes a hypernova might have initiated the Ordovician-Silurian mass erxtinctiopn event that occured about 440 million years ago. Many researchers now believe that short, hard gamma ray blasts occur on average every 100 million years. If so, Earth has been hit by at least several during its 4.5 billion year existence. Esteemed NASA scientist Stefan Immler at the Goddard Space Flight Center thinks Eta Carinae could very well explode in our lifetime, or even in the next few years. Well, maybe Earth has a little more time, right? Well, maybe not. Some astrophysicists at the European Space Agency have suggested it’s quite possible, based on observational analysis, that the killer star has already gone hypernova thousands of years ago and the speeding death rays could inundate Earth in as little as a year.